Go to the grocery store and you will find ten (or less) varieties of perfectly shaped, perfectly bland tomatoes. 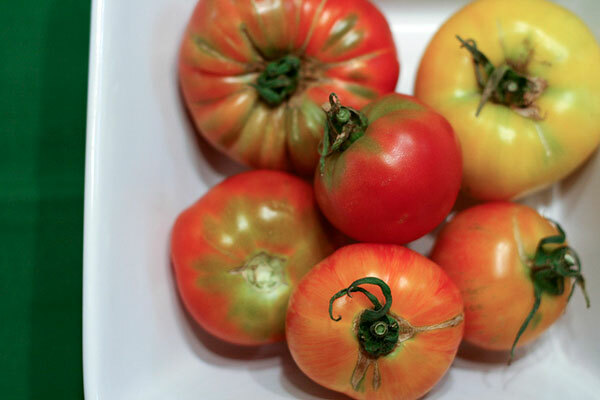 Seek out a good food market, like Eastern Market in Washington DC or our more local Boalsburg Farmers Market, and you will find dozens of heirloom tomatoes of every size, shape, taste, color, and crazy name. I was reading an article in a recent issue of National Geographic regarding agricultural biodiversity, and I came across a startling statistic — in a survey of 66 different crops, it was found that 93 percent of the varieties have gone extinct! For example, in 1903 there were 408 varieties of tomatoes offered at commercial seed houses; now there’s just a fraction of that. So this post is just a simple salute to a few colorful (and delicious) tomatoes that we picked up at the farmers market. 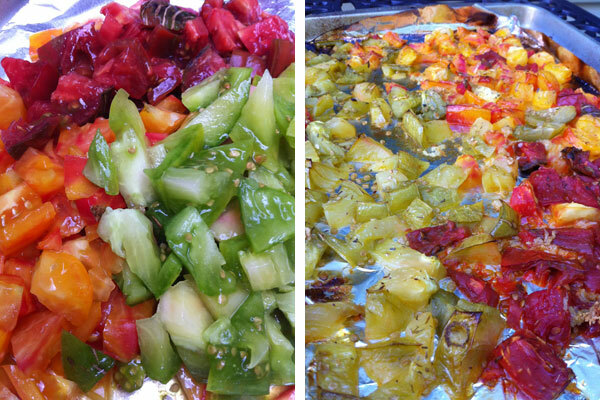 Here’s to you Mr. Stripey, Cherokee Red, and Aunt Ruby’s German Green tomatoes. Slice tomatoes into bite-size pieces. Arrange flat on a rimmed baking sheet. Add a dash a salt, garlic, and thyme on top. Roast for 40 minutes at 375°F. Roast an additional 10 minutes at 400°F to caramelize. 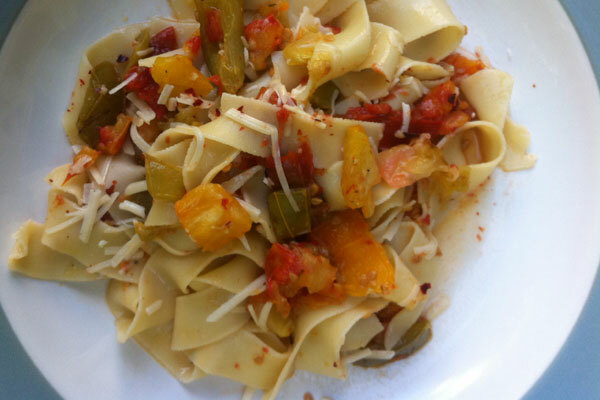 Toss with fresh pasta and Parmesan cheese and enjoy! Simple but divine! I love tomato season.